Placer County is yet another in a series of small, Sierran, Gold Rush counties created in 1851 on the heels of the 49ers. Auburn is its primary town but the county may be best known for holding the northern half of Lake Tahoe. There is much recent development pressure in Martis Valley — an excellent birding venue — and along Interstate 80. The county dips far enough west to have part of Folsom Lake, the northern suburbs of Sacramento, and some valley grasslands. Between them and the Sierran crest, and then points east, it has a wide variety of habitats: oaks, chaparral, pines, firs, and sage. The American River cuts an impressive swathe through much of western Placer County. County birding statistics and links are on Joe Morlan's site. A fine introduction is Bruce Webb's on-line Guide to Placer County birding. 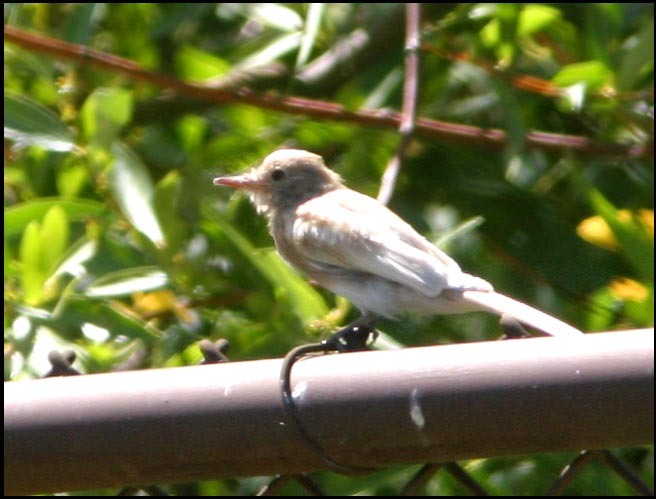 Virtually all my trips through Placer County have been enroute to somewhere else, and to date I have but one bird photo: this leucistic (partially albino) Black Phoebe at the little marsh next to Albertson's Market in Tahoe City.